For the money, 1990s Bimotas offer some pretty incredible bang for your buck. Obviously, a more modern machine of equal value will be faster, as well as more reliable and practical, but if the goal is to own something different, something exotic, and something with real style, not much can compete. 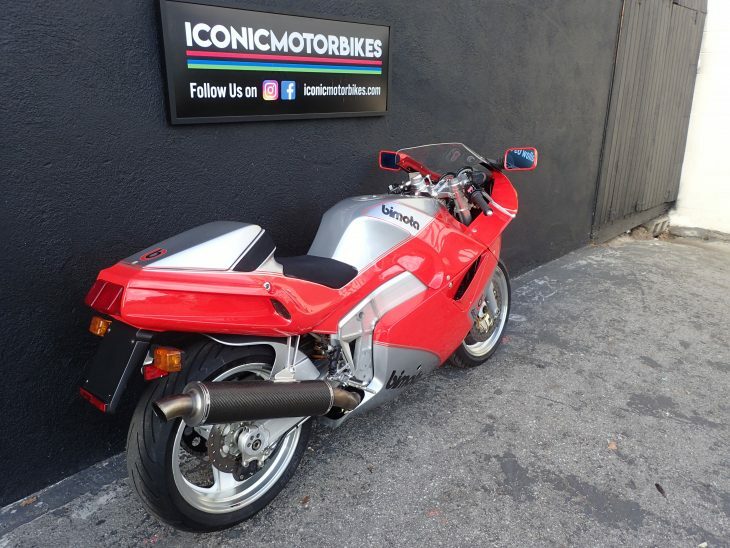 This Bimota YB10 Dieci being offered by Iconic Motorbikes has an asking price of $11,100 which is barely a third of what an RC30 is currently worth. Of course, there are some compromises. 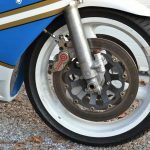 An RC30 from the same period represents some of Honda's very best engineering, with an almost obsessive attention to detail and few mechanical quirks. 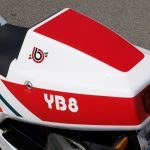 The YB10 Dieci is a rolling monument to quirk: Bimota's motorcycles of the period were really racebikes first, with concessions to practicality an afterthought at best. The Dieci obviously has the design cues common during the 90s, with a pair of round headlamps up front, an aluminum beam frame, and sleek, fully-enclosed bodywork. 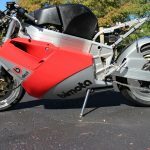 If that looks overly familiar, as if Bimota was just following a trend, you've got it all backwards: Bimota basically started the trend with the race-only YB4 that debuted back in 1987, a bike that only appeared in roadgoing trim after World Superbike rules required a run of street-legal machines be sold to the public. 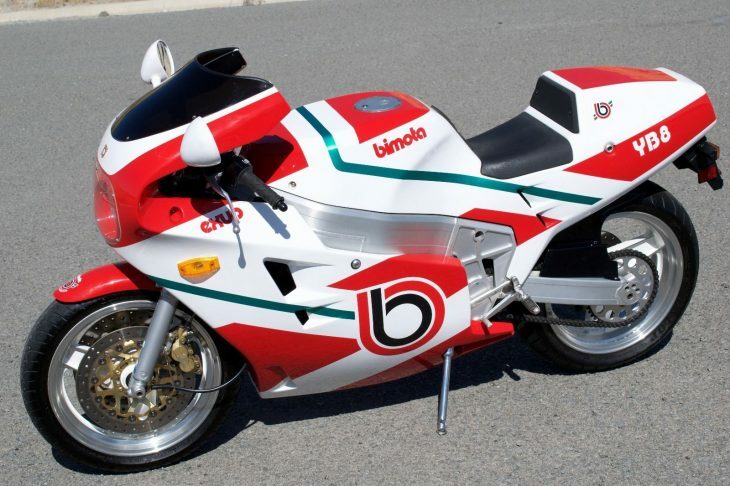 They're mostly forgotten by everyone but us motorcycle geeks now, but Bimota was one of the original competitors in World Superbike and nearly won the inaugural event. 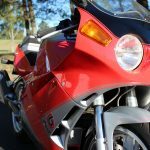 The YB10 is an evolution of that bike, with a larger engine. 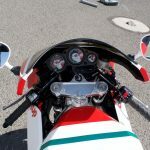 Invariably, Bimota tuned its borrowed powerplants for increased performance, although the results were often dubious and the claimed power gains generally minimal anyway. 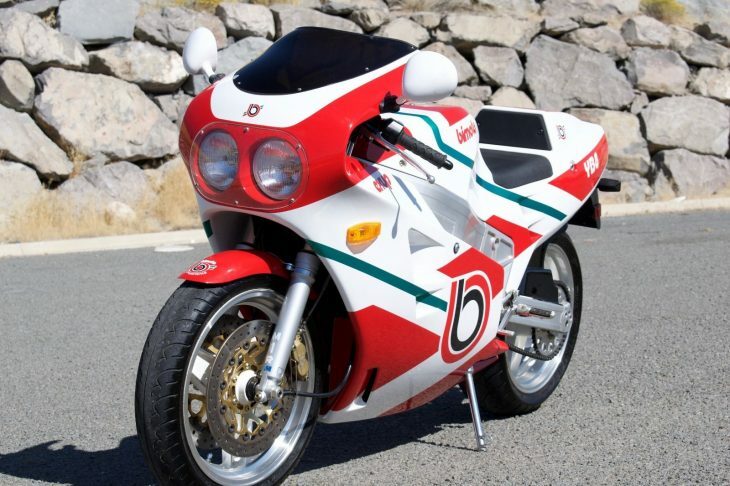 Bimota's real claim to fame was chassis design that resulted in light weight and incredible agility. 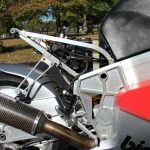 In an era when Suzuki's GSX-R was using an antiquated double-cradle frame, Bimota's gorgeous aluminum beam design pointed the way forward, and a close look at the craftsmanship on display is impressive. 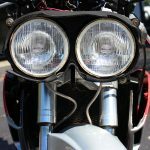 Racy styling is easy to do, and the term "sportbike" gets thrown around pretty liberally, but the YB10 was the real deal. 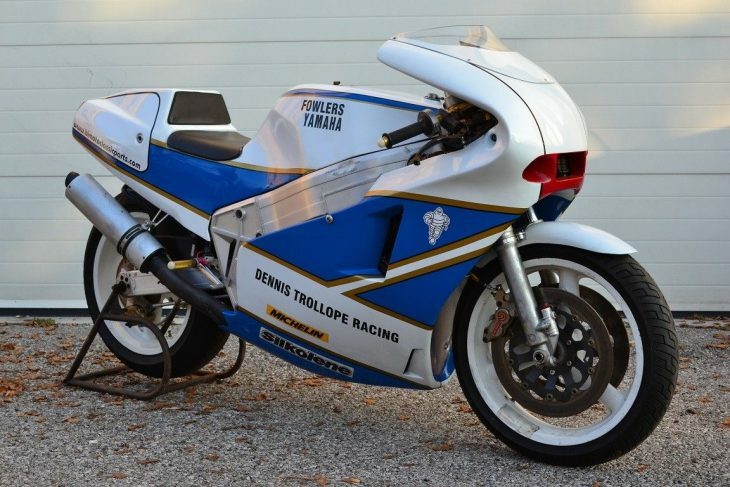 If you've never seen one of these without the bodywork, it's amazing how spare and minimalist it is: there's almost nothing there that isn't dedicated to speed. Bodywork consists of just four major pieces, plus a couple inserts for the radiator vents. 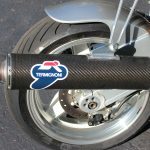 The tail and tank cover is one piece, there are two side panels, and the upper fairing, all held on by quarter-turn fasteners, so the bike can be naked in minutes. 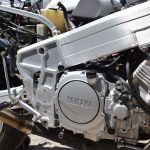 Which is good, since working on the bike is frustrating at best, with that gorgeous frame wrapping so closely around Yamaha's 1002cc five-valve Genesis engine and five-speed box that access can be difficult, depending on what you're trying to do. Also guys, it's pronounced "bee-mo-tuh" not "by-mo-tuh." Just as Italian cars with two turbos like the old Maserati Biturbo are actually "bee-turbos" not "by-turbos." Just had to get that off my chest. 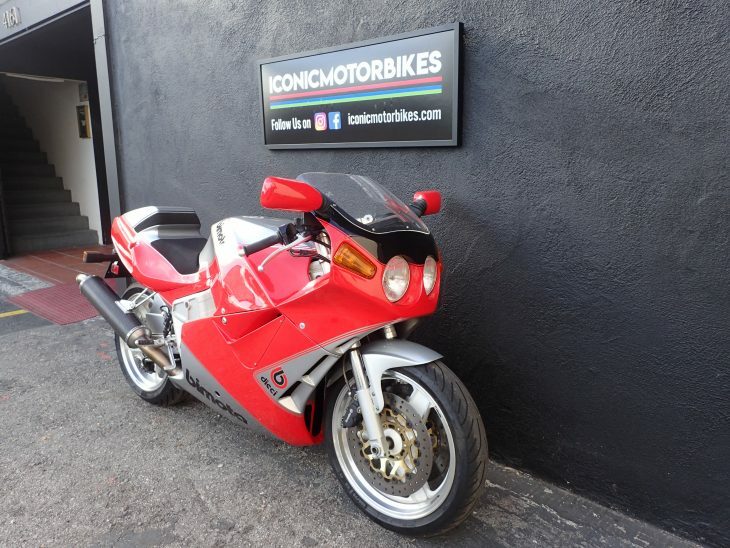 1991 Bimota YB10 Dieci – Rare 1 of only 224 – Fully Serviced! Bimotas are well known for their Italian style, class and over the top engineering. This YB10 is no exception to the rule with its billet machined frame, its one piece (and seamless) upper fairing, billet triple, classic style wheels… so cool! The YB10 wasn’t just eye candy either, it was tested my a few magazines and came back with a top speed of 172.9 mph which is quite respectable for 1993! Only 224 of these were every made! Not only do you get Italian style but you get the reliability of a Japanese motorbike with the YB10. 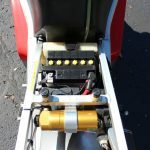 The power is supplied by a FZR1000 which means motor parts are never a problem to source! 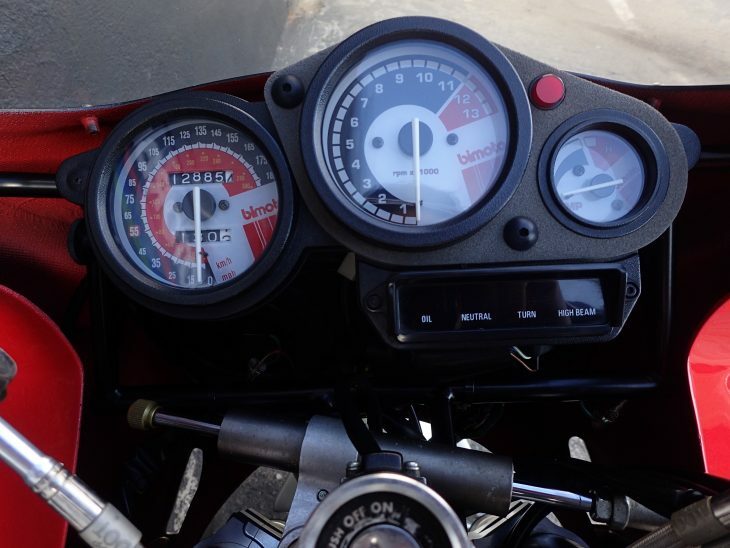 This Bimota was serviced by Bob Steinberger, a very well known Bimota expert about 2 years ago with very few miles after the tune. 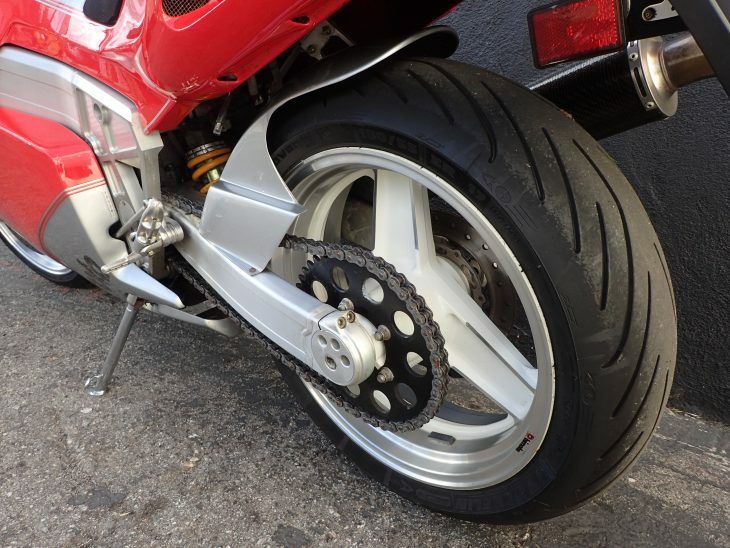 Service included new tires, new chain and sprockets, new battery, fresh oil, new jets, etc. 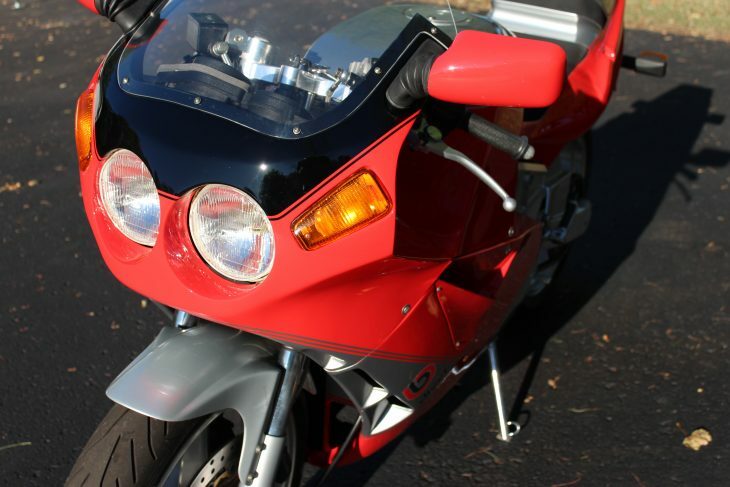 She’s in fantastic condition with only 12,885 miles and ready for a new home. Want to see her in person, fly into LAX, we’re only 15 minutes away and ride out! We’re right on the border of Venice beach and only a few miles from Santa Monica. Nice to see this one's been ridden a bit, so you can actually put some time in on your new exotic without "ruining" a zero-mile museum-piece. 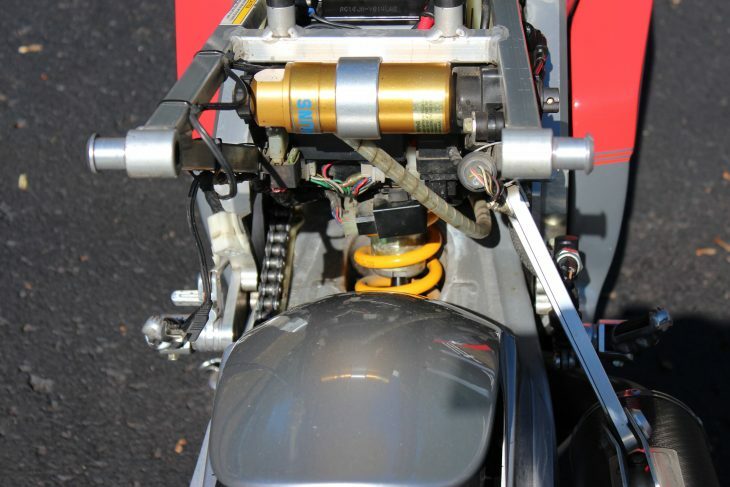 As indicated, parts for the powertrain shouldn't be a problem, although the aforementioned tight packaging within the frame means servicing will be more time consuming and expensive than it would be on the donor Yamaha. Bodywork, on the other hand, could be a real issue, although Airtech does have Dieci panels available. 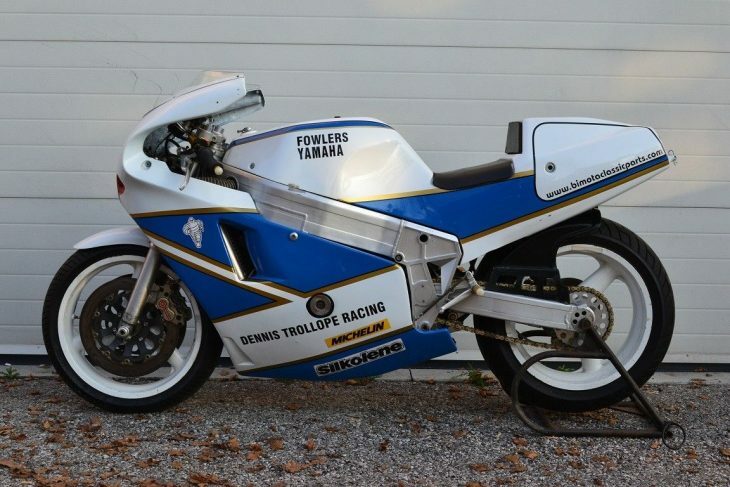 I've long said that if I ever bought one of these, I'd buy a set from them, have it painted to match, and display the OEM bodywork so I could ride the bike without worrying that a patch of gravel would ruin one of the 224 ever made! I've mentioned this before, but everything just sounds cooler in Italian. If you want to intimidate someone, just shout gibberish at them in German: anything you say sounds clipped and military and very, very serious. But yell at someone in Italian, and it just sounds like you're trying to very emphatically seduce them. I mean, Italian car and motorcycle manufacturers don't even have to try, they just basically describe the thing, and it still sounds cool, exotic, and expensive. A Maserati Quatroporte? You mean a Maserati "Four-Door"? And bikes are even lazier: Testastretta is just "Narrow Head" and Desmosedici sounds plenty exotic, but it's just "Desmo Sixteen [Valves]." 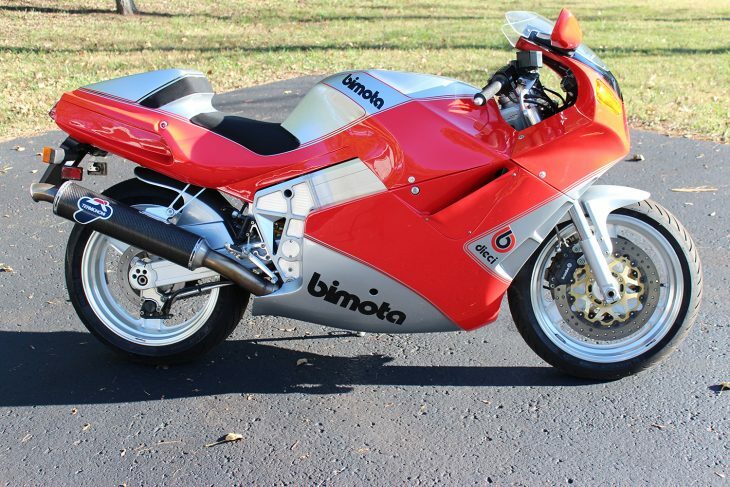 Today's Featured Listing Bimota YB10 Dieci might be the worst offender though. In English, it's just the "Yamaha-Bimota #10 Ten." Of course, the fact that they were freed from any need to be practical also means that they can be a real pain to service. 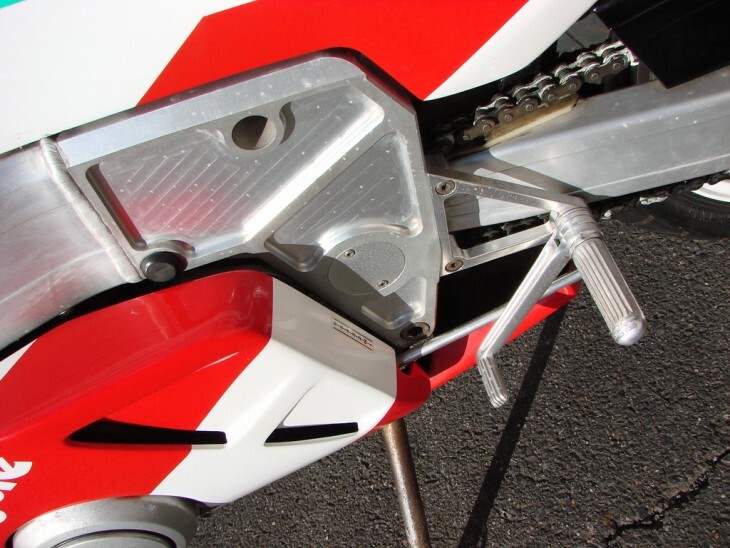 The stiff, light aluminum beam frame that was Bimota's signature during this period was wrapped tightly around the engine to keep weight down and centralize mass, so many of their bikes need to be pretty much completely disassembled before you can perform basic maintenance. Thankfully, they were also designed with body panels that are easily removed with a minimum of fuss. Seriously: look closely at those plastics and note how few seams and mounting points are visible: the tank cover, seat, and tail section are all one piece. 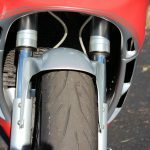 Of course, there's a downside to that simplicity as well: drop a modern sportbike and you might just have to replace a couple sections of fairing or a side panel or two. But when your bodywork consists of just four or five separate pieces and only 224 machines were ever produced... Well let's just say that if I owned a Bimota Dieci and planned to ride it regularly, I'd order a set of Airtech fairings and have them painted up to look like the original parts, then hang the stock bodywork on my livingroom wall. I'm not sure exactly what changes were made between the 1987 YB4 and the 1991 YB10, but the bodywork and frame look suspiciously similar. That's no bad thing, as Italian vehicles always do seem to get better with each successive generation as the kinks are worked out, right up until they finally get it right and then promptly discontinue the model. 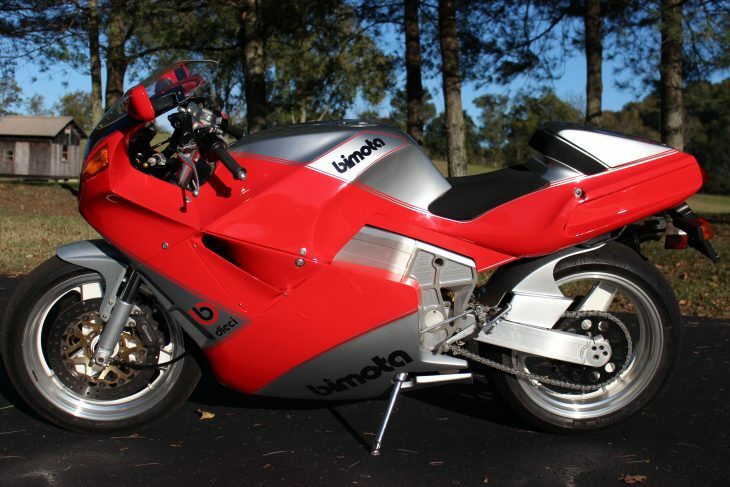 Similar-looking Yamaha-engined Bimotas were powered by 750 and 400cc versions of their five-valve Genesis liquid-cooled inline four, but this is the big daddy, motivated by a nearly stock 1002cc engine and five-speed gearbox from the FZR1000 that produced 145hp. 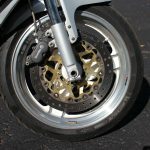 With a claimed weight of 407lbs, nearly 70 less than the donor bike, the slippery superbike could hit a tested top speed of 172mph, with stability provided by the fully adjustable 42mm Marzocchi upside-down forks up front and an adjustable Öhlins shock out back, which the seller has helpfully photographed for prospective buyers. 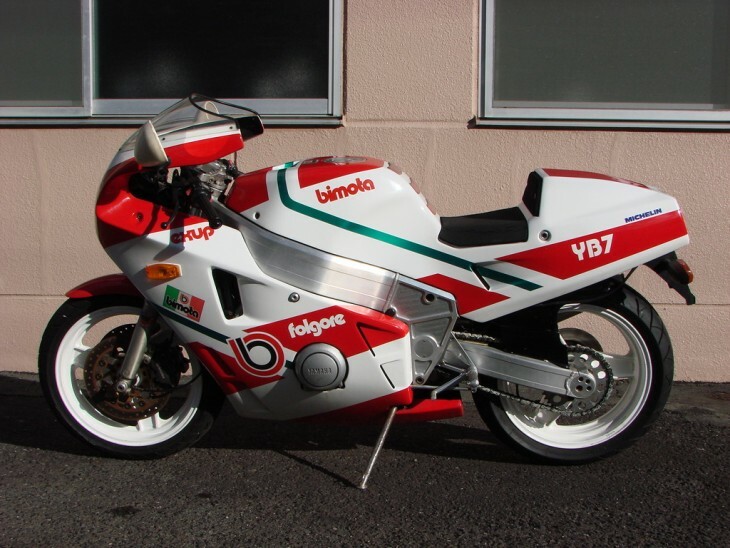 It's fitting that the last couple of Bimota YB4s we've featured have been race bikes, since the YB4 was a competition machine first, and a road bike second. In fact, only a racing version was built at first, until World Superbike homologation rules required 200 roadgoing examples be built. The YB4 competed head-to-head with the best Japan could build, first in Formula 1, and later on in the new World Superbike series, an amazing feat for such a tiny manufacturer. 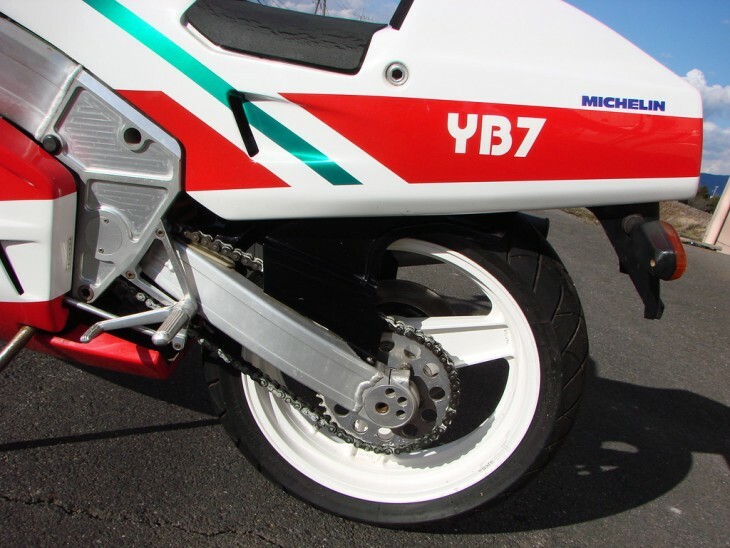 First produced in 1987, the YB4 was powered by Yamaha's 749cc five-valve "Genesis" motor and six-speed gearbox, which it ironically used to compete against Yamaha's OW01. 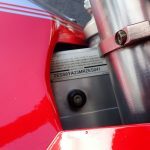 Weight for the roadbike was 396lbs dry, and both versions used Bimota's stiff, lightweight aluminum beam frame and swingarm, so handling was predictably sublime. 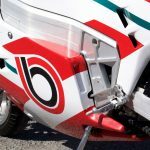 Before their untimely demise, Bimota had become a manufacturer of expensive toys for well-heeled collectors or the occasional race team maybe looking for something to differentiate themselves from all of those very competitive Kawasakis and BMWs. There's nothing inherently wrong with recent Bimotas, but the Japanese Big Four and the Germans have caught up, and they didn't provide the kind of competitive advantage that bikes like the YB4 offered to racers and road riders of the 1980s. 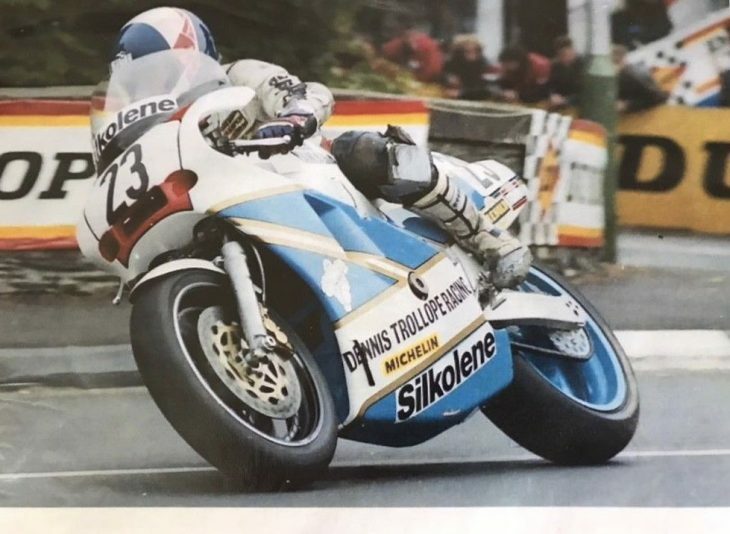 4th overall in the 1988 World TT F1 (Superbike) Championship - that year Fogarty won it, second Joey Dunlop, both on Honda RC30. 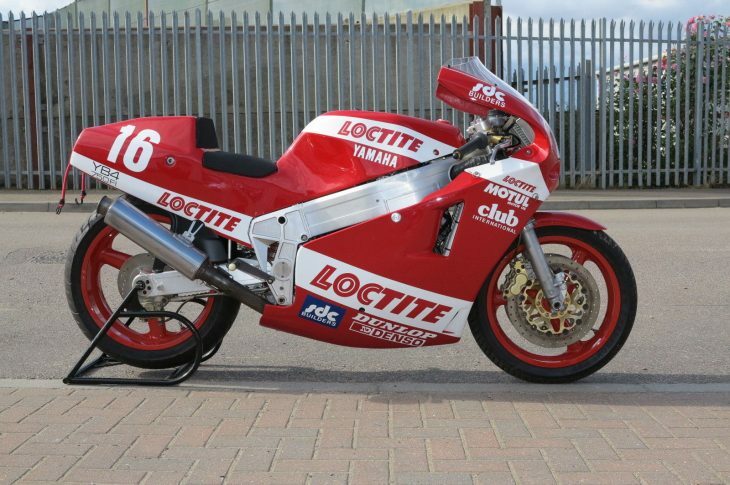 This bike was also in the top ten results of TT IOM 1988 and 1989. 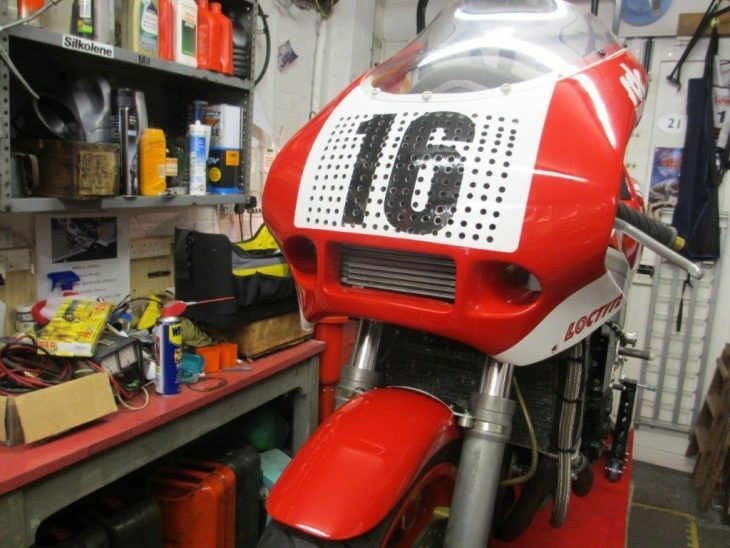 Rare opportunity to acquire a piece of the early Superbike era and of Bimota history. 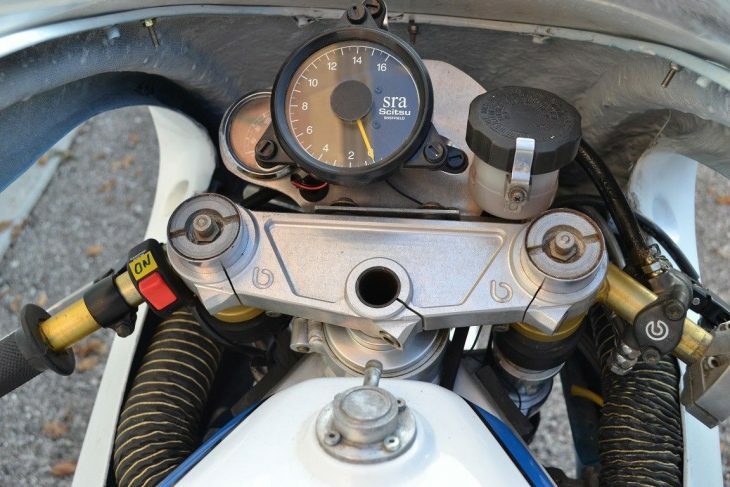 Bike is genuine, complete and working with the right patina, fitted with the correct carbs engine with magnesium sump. Letter of verification by Dennis Trollope with the bike. Bike is currently located in 33080 Roveredo in Piano, Italy but i can get them delivered all around the World at cost, no problem. I can supply US contacts for reference. This example comes to us via a seller that should be familiar to RSBFS and CSBFS readers. I've never met him, but he obviously has great taste in motorcycles. There is very little time left on the auction, and bidding is up to just north of $5,600. 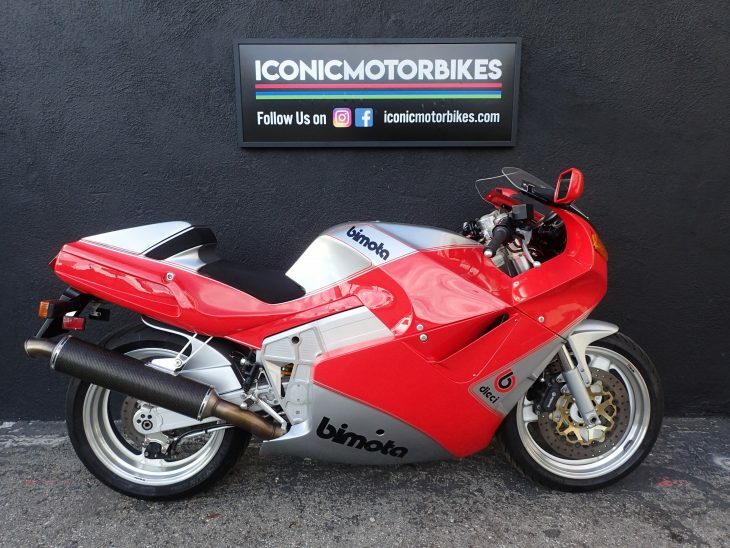 Bimota values in general and pretty low right now, but this particular machine I'd hope would buck that trend: it's got racing history and plenty of patina. It's obviously a bit scruffy around the edges, but that's pretty much par for the course with well-used racebikes. 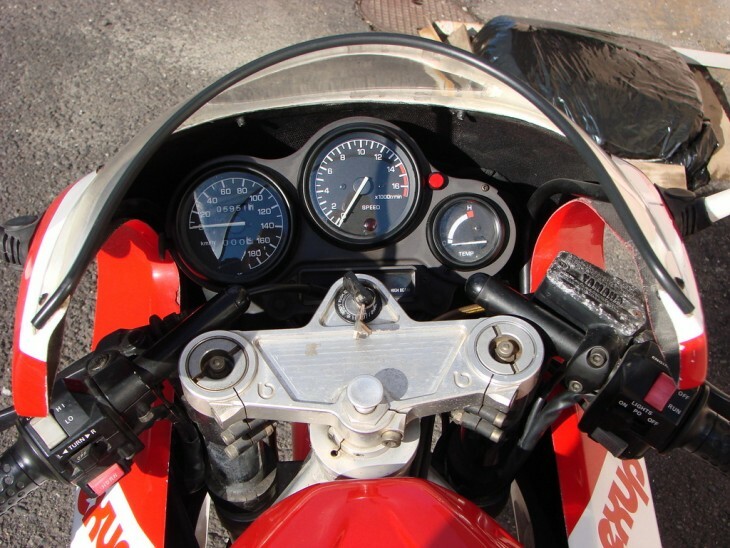 By the end of the 1990s, it could be argued that Bimota was basically irrelevant. 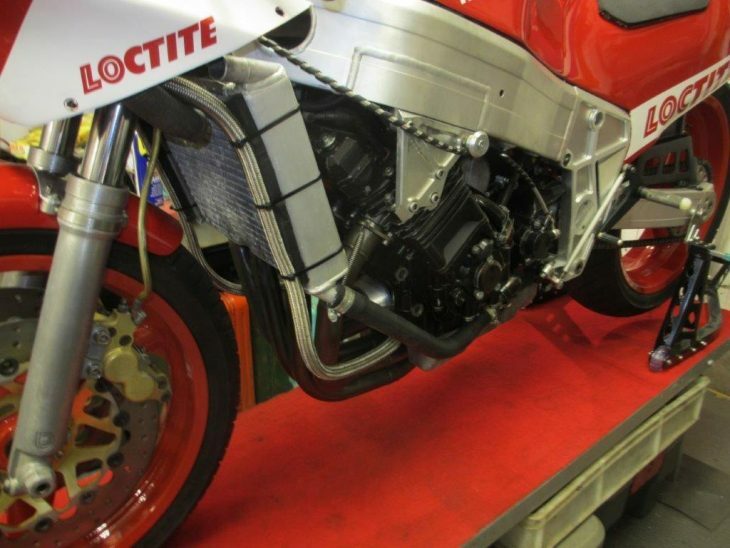 After all, the whole point of a Bimota was simple: take a powerful, reliable engine from a bike from an established manufacturer, then slip it into a stiff, lightweight frame with the best suspension money could buy at both ends, and wrap it all in simple, lightweight bodywork. The resulting bikes were free from practical considerations, expensive, and very fast. 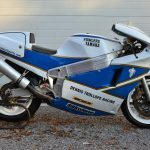 Sure, they often weren't quite finished as delivered, but a bit of time setting one up to your personal preferences meant you had the ultimate exotic racebike for the road. 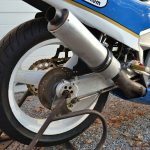 Unfortunately, the relentless pace of the Japanese manufacturers meant that their powerful, reliable engines were soon housed in bikes that were lighter than past efforts and handled much better than ever before, erasing any real advantage the Rimini machines had over their stock counterparts. 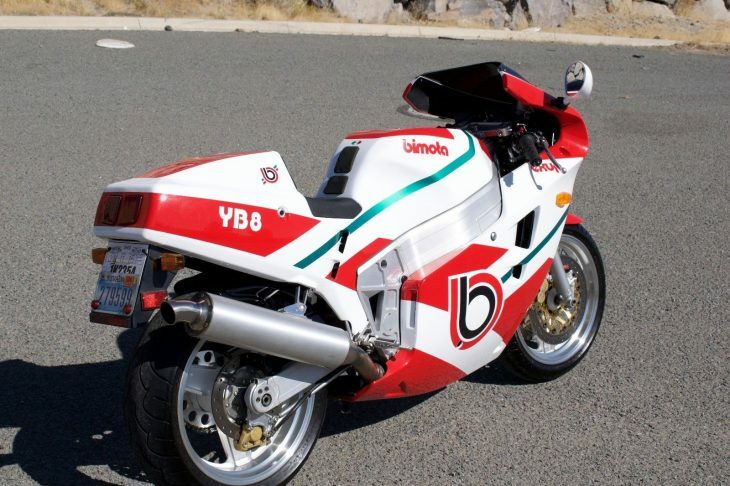 But before that happened, bikes like this Bimota YB8 showed just how spectacular the results could be. The YB8 was an evolutionary design, and used same basic frame as the YB4 and YB6, but used the larger, more powerful FZR1000 engine, complete with the famed EXUP system. 149 claimed horses doesn't sound like much in this era of superbikes making more than 200hp at the rear wheel, but keep in mind that Yamaha felt that the FZR only needed five gears for its literbike instead of the six found on 600s and 750s, and the 1002cc engine has a spread of torque that would make a modern machine jealous. 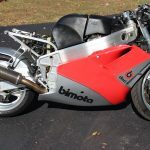 Bimota claimed their alloy-framed confection was a claimed 64lbs lighter than a donor bike that no one would call slow even today. In the YB8, it meant a tested top speed of 173mph to match the race-bred handling. Here is a quick video with walk around etc... Sorry for my terrible mic on my camera. Also may seem like I'm winding it out a little at the end of the video, was just trying to show that it runs good on power, was no where near red line. Also switched to open source music so my apologies if it is annoying. Bought the bike from a guy who had it sitting in his living room for several years. 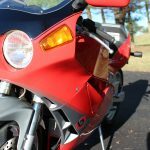 I love the early 90s carbed full fairing sport bikes so I had to have this when I saw it. The only reason I am selling is to fund another purchase that I have been given exclusive opportunity for. 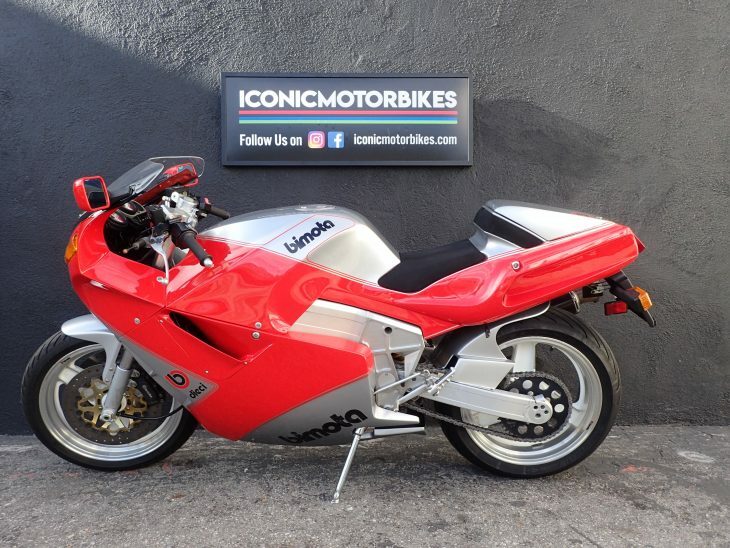 I was given a folder full of paperwork, with full service history, manuals, brochures etc... from what I see in there this bike stickered for $23,000 in 1992. I am also under the impression that this was one of only a handful of these imported into the U.S. for sale. THE ODO IS AT 3200... I AM OF THE UNDERSTANDING THAT THIS IS IN KILOMETERS... which would translate to ~1,900 miles...PLEASE UNDERSTAND I AM NOT 100% CERTAIN OF THAT, IF YOU KNOW HOW I CAN FIND OUT FOR SURE LET ME KNOW, WORST CASE SCENARIO IT HAS 3200 MILES. Bike is for sale locally for $18,500 obo although I did not know exactly what to ask as the bike very well could be one of a kind in this condition, with this low of miles. I am definitely negotiable. If bike does not sell prior to auction end it will sell to highest bidder. Local buyers encouraged to come see the bike in person, all others I can send pictures or video of whatever you would like to see. SHIPPING: I am happy to assist your shipper in any way I can, I can also provide a shipped to your door price where I arrange all of the shipping. 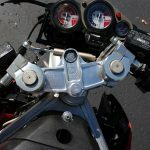 Shipping motorcycles these days is very reasonable usually costing 200-600$ depending on how far you are from Reno, NV. If you have ANY questions please feel free to contact me call or text at 775 742 8807 or message through eBay. 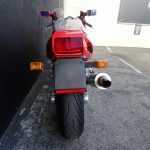 In case you missed it in the excerpt above, the seller does include a video of the bike, including a walk-around, start-up, rev, and even a ride. I recommend you turn the volume way down, or skip forward to the 2:20 mark to avoid the really horrible music that's even worse than the seller suggests. It's not the greatest video but it does give you a pretty good idea of what to expect. The seller is very honest about the fact that he wasn't sure how to price this, which is refreshing. Unfortunately, that $18,500 asking price seems optimistic, considering what 90s Bimotas have been selling, or not selling for recently. 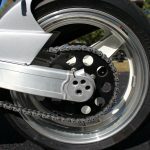 These Bimotas have a bit of a kit-bike feel to them, but with a bit of patience and, in some cases, even a bit of re-engineering, they can be made into very fast machines, since the fundamentals are all there: the trademark frame, powerful engine, high quality, if slightly dated suspension, and lightweight bodywork. 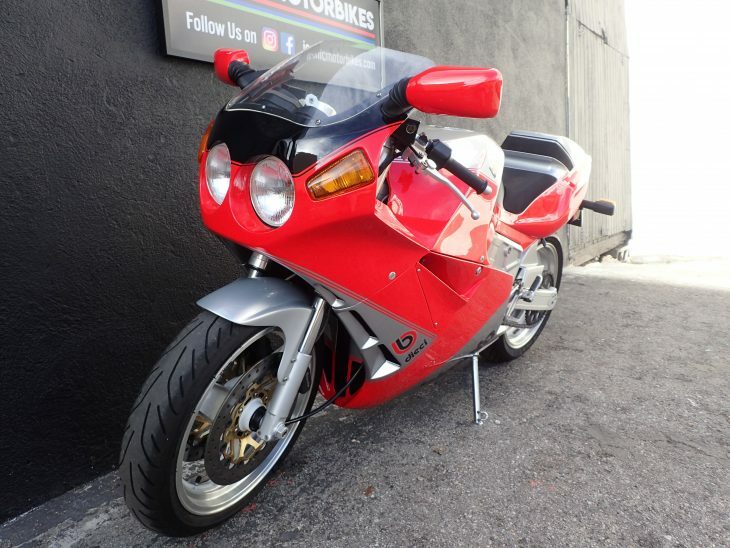 This does look like a very nice example, a sharp, low-mileage bike that should need nothing, whether you plan to display it or to use it on the road. Although it's often the slinky bodywork that people remember about Bimotas, the frames are what really define them. 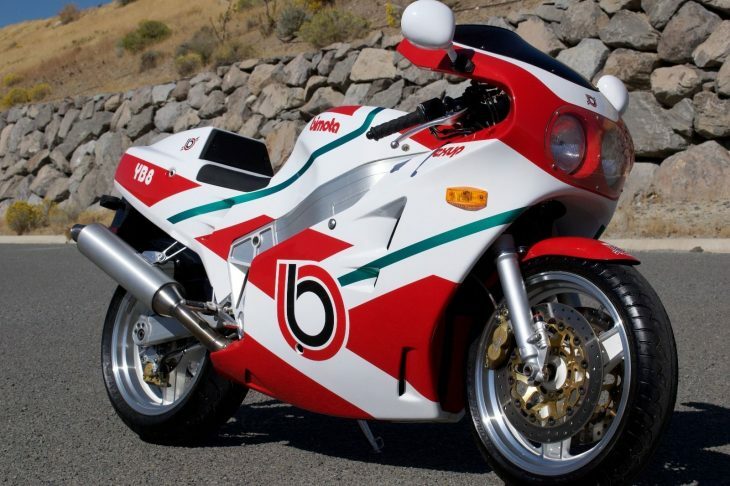 The Bimota YB4 was designed around Bimota’s signature and unmistakable beam frame they used throughout the late 80s and 90s. No soft, moulded contours here: the spars look like girders that were extruded by some giant, industrial device, then cut and welded into place, with access to that five-valve Yamaha "Genesis" engine clearly an afterthought... The frame was amazingly stiff and, equipped with typically top-shelf suspension bits at both ends, the YB4 offered superlative handling. Introduced in 1987, the YB4 started out as a pure racing machine, with no road-legal counterpart. 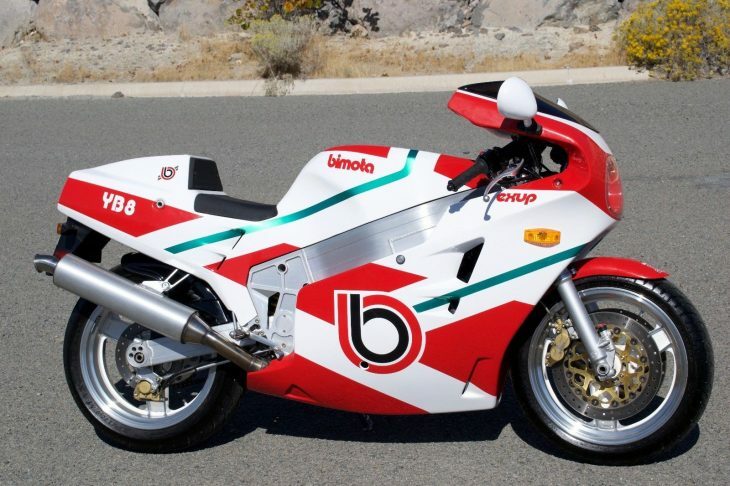 But when rules were announced for the new World Superbike racing series, Bimota was forced to make a limited number of roadbikes for homologation purposes in order to compete. The bike was successful in both the earlier Formula 1 championship that predated the roadgoing YB4 as well as the later fledgling World Superbike series, where it successfully competed against Yamaha’s own highly-developed OW01, a testament to the YB4’s handling prowess. 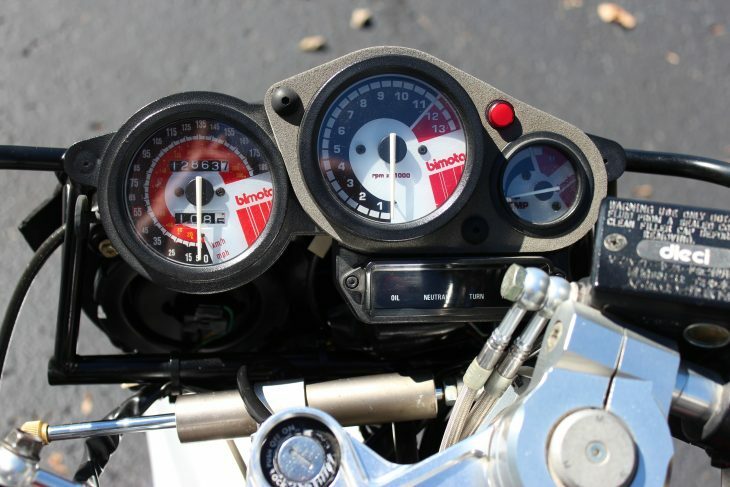 Of course, being a Bimota, the engine is far more pedestrian than the beautifully crafted frame and sleek bodywork. 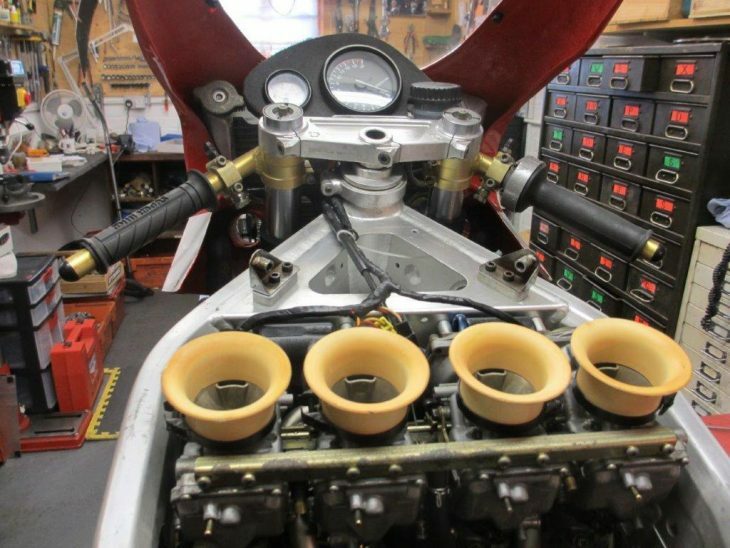 The YB4 was powered by a 749cc version of the five-valve Yamaha “Genesis” motor which, while not very exotic, packed plenty of performance, and that powerplant was backed by the standard Yamaha six-speed gearbox. 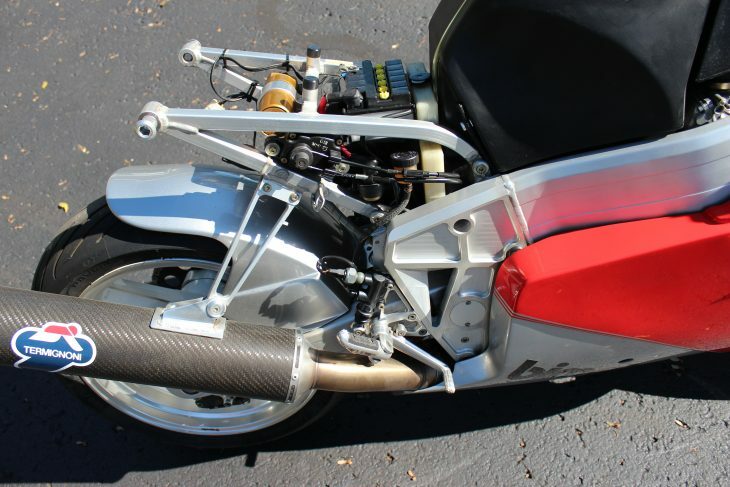 The roadbike weighed in at a claimed 396lbs dry and used fuel injection, but the racing machines featured carburetors. Just over 300 were built and unusually, the YB4 is visually almost identical to the bigger-engined and more common YB6 that was stuffed full of 1000cc Genesis motor. Today’s YB4 isn’t a road bike, or even a road bike converted into a track-only machine. 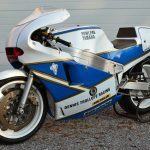 This YB4 is actually the reason we have any roadgoing YB4s at all: it’s a genuine World Superbike racing bike as raced by Steve Parrish’s team with Keith Huewen at the controls. 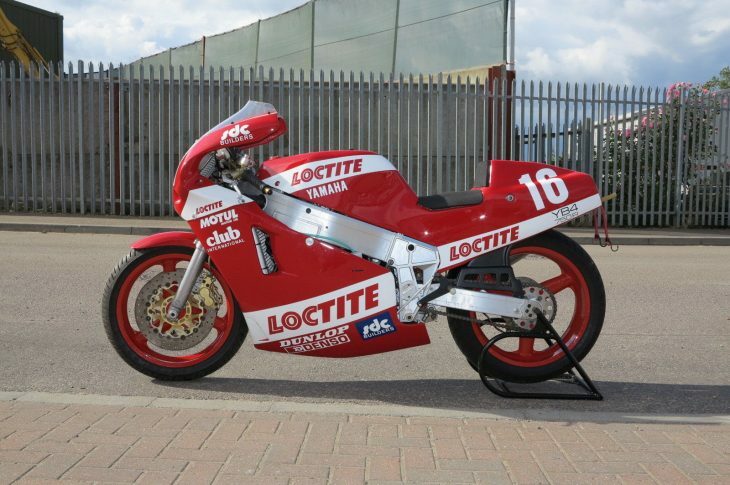 It is the 1988 Bimota YB4 WSBK Team Yamaha Loctite Parrish/Heuwen The bike was raced in 1988, ridden by Keith Huewen who is now a Moto GP commentator. 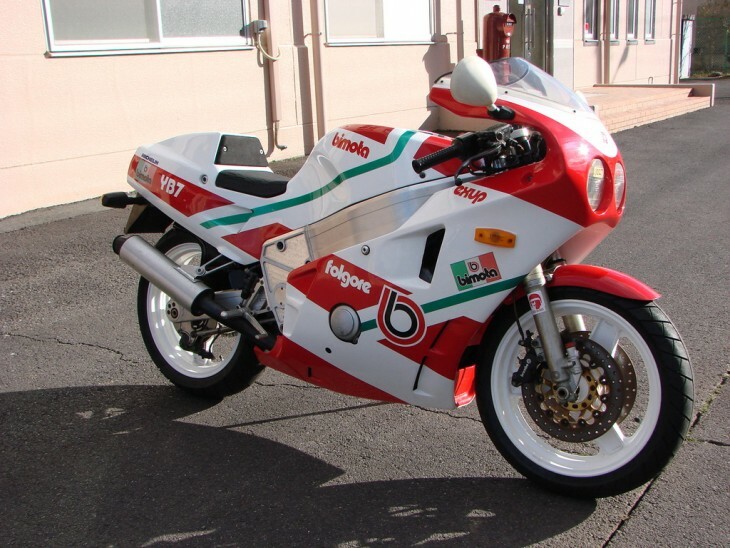 It was ridden in the British Championship and also some World Championship events like the Hungaroring. It has all the genuine parts with special quick release pipes magnesium sump etc. and very important it is exactly as it was raced. There were originally only 4 imported to the UK Team Loctite had problems with the fuel injection and converted them all back to carburettors. Iconic bike of an iconic race era. Ride, parade and collect! Bulletproof investment. 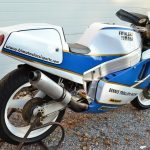 According to the seller, the bike is currently in the UK, but that shouldn’t pose much of a problem for the well-heeled or seriously dedicated collectors considering a purchase of this machine. What's it worth? 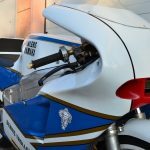 Well, it's basically a successful racing machine from an exotic Italian manufacturer that was campaigned by a famous rider for a famous team, making it a one-of-a-kind piece of motorcycle history. 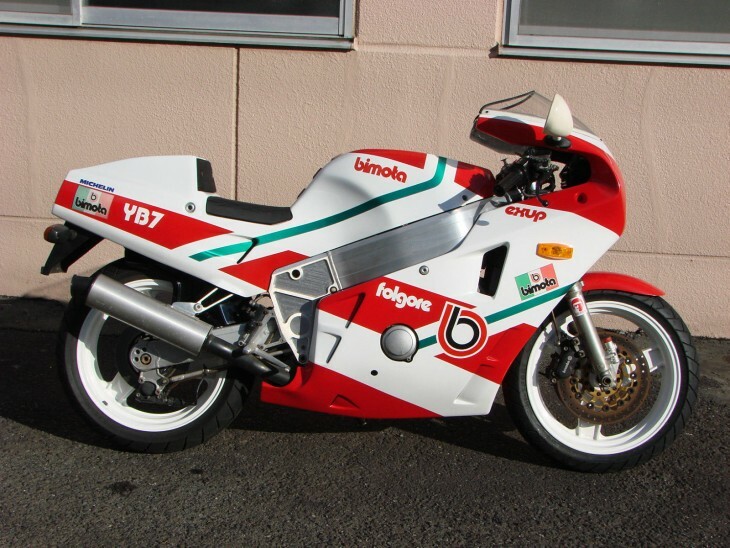 Only rarely seen outside Japan, the market for which it was exclusively designed, the Bimota YB7 is like a 3/4 scale YB4. 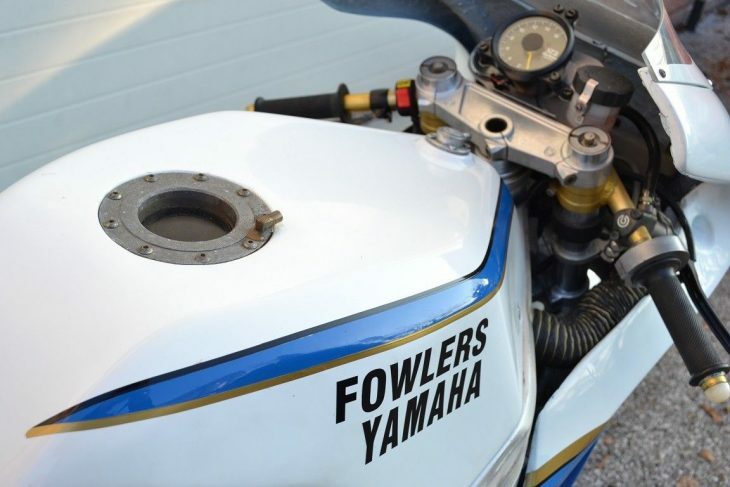 The bike is based around the FZR400 powerplant, so it's obviously no real powerhouse, with a claimed 65hp from the 399cc liquid-cooled four. But that just means you get a sweet-handling, four-cylinder exotic with performance you can actually access, seeing redline in multiple gears, instead of just first, without finding yourself in the pokey. 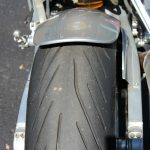 And weighing in at 352lbs dry, it's not like the bike is actually slow: 136mph is plenty to have fun with, and the bike has a reputation for being relatively easy to ride and unintimidating as well, even in everyday traffic. 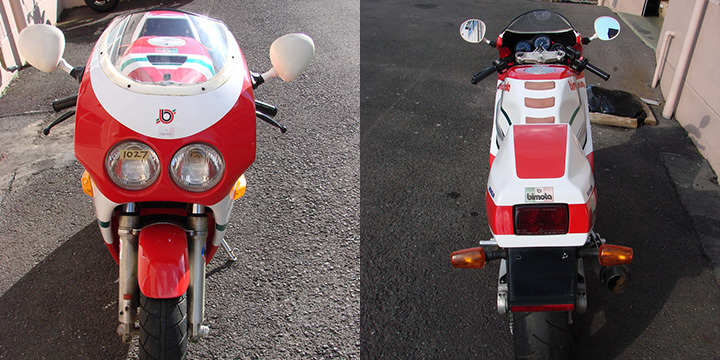 They're very rare as well, with less than 500 produced and, being Bimota, they're certainly collectible. So these fill a bit of a weird niche: an everyday exotic that won't try and kill you. For me, that's a big plus but, for many speed-junkies, anything less than 750cc's is a complete waste of time. Located in Santa Ana, California. Bike has 5951 km = 3570 miles on it. This Bimota is based on the Yamaha FZR400. These bikes were built for the Japanese market only. 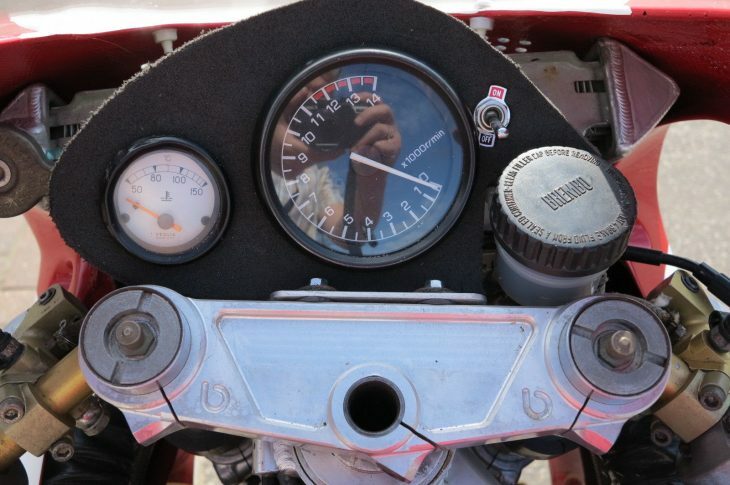 Bimota made approx. 321 of these bikes. 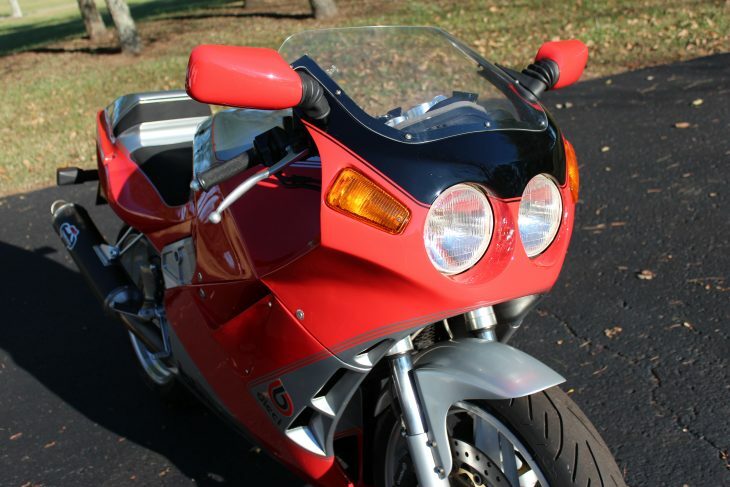 This bike is in very good condition with low miles. The engine runs very good. There is no crash damage on this bike. I do not have a title for this bike. Bike is being sold with a bill of sale only. Non USA buyers will have to make there own shipping arrangements. I can recommend a very good shipping company in Los Angeles. Bike is being sold as is, no returns. So, ask questions and look at the pictures carefully before you bid. Again, this bike is being sold with a bill of sale only. I do not have a title for this bike. 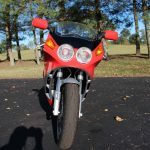 The seller mentions that he doesn't have a title for this bike, so be sure to check with your DMV if you plan to register it for the road. Caveat emptor: in some states, this will definitely cause headaches, although it may be no problem at all in others. That being said, it's a really cool little bike that has, so far, generated very little interest. 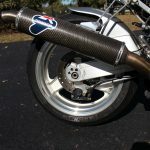 Which is a shame: parts to maintain it should be easy to come by, even if fairing panels are not, and the bike will provide more capability than probably 90% of riders can actually exploit.